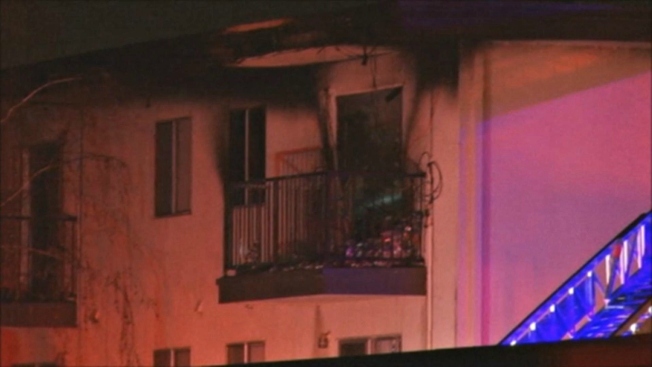 A two-alarm fire in Hayward early Monday displaced 31 people and forced fire crews to rescue seven others, according to fire officials. Pete Suratos reports. A two-alarm fire in Hayward early Monday displaced 31 people and forced fire crews to rescue seven others, according to fire officials. The blaze ignited around 1 a.m. at the Tiki Garden Apartments located at 145 Lund Ave., according to Hayward Fire Department Cap. Don Nichelson. Responding crews stretched ladders to balconies to rescue a number of people, including a man in a wheelchair, Nichelson said. No one was injured in the fire, and no one was transported to the hospital, according to Nichelson. Residents remain displaced Monday morning because gas and electric lines were compromised in the fire, Nichelson said. Roughly three to four units will be compromised for several days, according to Nichelson. The other units could be reopened by Monday night. The Red Cross opened a shelther for the displaced individuals at Cal State East Bay's physical education building located at 25800 Carlos Bee Blvd.